(Bloomberg) -- France’s economy will perform better in the coming quarter than previously anticipated because it’s relatively sheltered from global headwinds and fiscal stimulus will help consumer spending, its statistics office said. 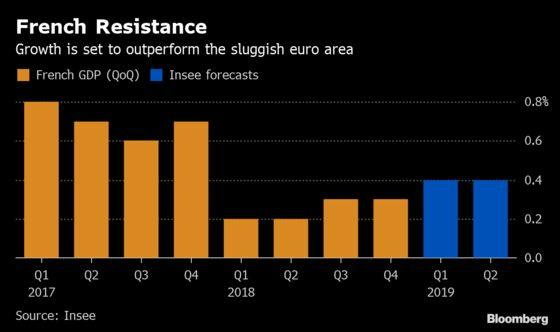 France is proving somewhat resilient to a broad euro-area slowdown as it depends less on foreign trade and domestic growth has been fueled by tax cuts introduced in response to the Yellow Vest protests. Separately, Finance Minister Bruno Le Maire said the government will lower its full-year prediction to 1.4 percent from 1.7 percent, though that’s still above the average pace expected for the euro area. Insee expects gross domestic product to rise 0.4 percent in both this quarter and next. In December, it had expected growth to slow to 0.3 percent in the second quarter. “The French economy is less exposed than others to the turbulence of global trade,” Insee’s Chief Economist Julien Pouget said. The statistics agency also said the Yellow Vest turmoil had a smaller economic impact than initially thought. Fourth-quarter growth was only around 0.1 percentage points lower than it would have been without the protests, even if the impact in some towns was more severe. There are numerous risks weighing on the outlook, first and foremost Brexit, though Insee says Ireland and Germany are more exposed. Alongside its forecasts, Insee published a study of how Brexit would affect different European economies via trade channels. In the case of a soft Brexit -- with a transition to Jan. 1 2021 -- an increase in tariffs would reduce French GDP by 0.3 percent compared to what it would have been otherwise. A hard Brexit with no deal would take off 0.6 percent. In Germany, however, GDP would be 0.5 percent lower in a soft Brexit and 0.9 percent lower in a hard Brexit, according to the study. Insee cautioned that its estimates don’t take into account reorganizations of global production chains or issues such as currency and migration. “The consequences of Brexit are potentially multiple and difficult to evaluate,” Insee said.